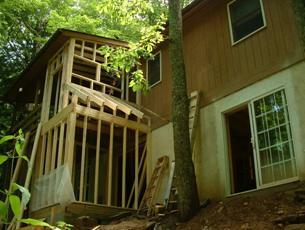 Profiles In Wood, Inc. can dramatically increase the value of your existing home. Sometimes it just does not make sense to sell when there is hidden value in you existing home especially if you like where you live. Even if you get $1 of increased value for every $1 spent your ahead. No selling or moving costs, no family uprooting and best of all your address does not change! Typically, though, you get back $2.00 for every $1.00 that is spent. That's a 200% return with no risk! 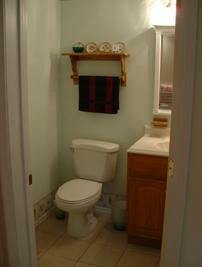 Lets look at recent remodeling job and see the results. 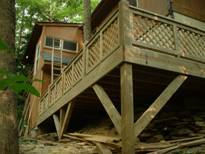 The customer had approximately 875 square feet of living space with a partial wrap around deck sitting on a block foundation. 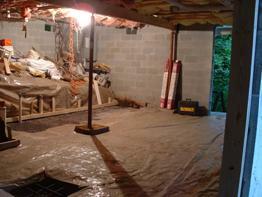 By modifying the dirt basement, an additional 600 square feet of living space could be achieved. The customer also wanted a half bath, sliding French doors, an entrance door, additional window, another deck and no decrease in functionality of the existing home. Quite a task but you will see the results! 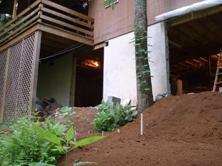 We started with a dirt floor space that needed to be dug out. 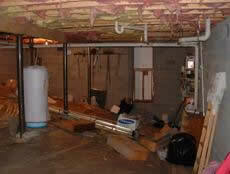 You can see the support girder with columns and the hot water heater. The only access to the area was a small half door at the end. 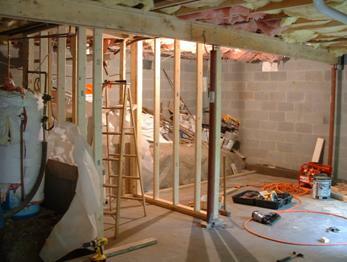 In order for the bathroom to fit, the hot water heater needed to be moved and a support beam removed. The customer also wanted a full 8' ceiling so the existing plumbing had to get rerouted. So the work begins to remove the dirt to allow for an 8' ceiling, open the half door to a full door, cut the foundation to allow for the French doors window and the stairs. You might wonder where the stair way is? Well in order ensure that no functionality of the existing house is lost, we decided we decided to build the stairwell on the outside of the house. We'll see that a bit later. Here you see work starting to dig out the floor to make it 8'6" to allow for gravel underlayment and a 4" concrete floor. All the support columns had to be removed with new columns installed. Look at the before and after columns. Note the large support footing for the columns. Work continues with the digging. 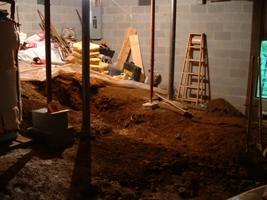 The only issue is until you cut more openings in the foundation you can't get the dirt out. 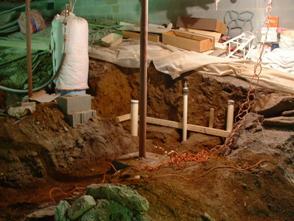 Here you can see the first breakthrough in the foundation to allow for dirt removal. 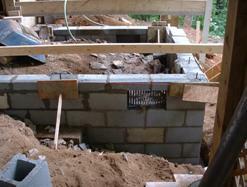 Note the temporary support beam over the opening to support the floor until the permanent header can be installed. 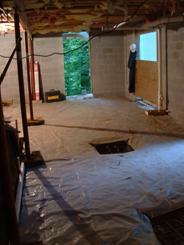 This will eventually be the area for the stair way and closet. 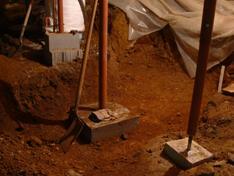 The digging goes much easier once the openings are made. The second opening is then made for the French doors, the third for the full entrance door and the forth for a large window. 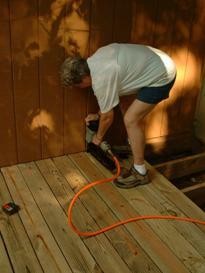 The portion of the deck over the first opening will be removed and replaced with a stair well. 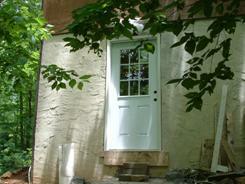 Look how different the foundation looks with the new doors and window! It's starting to look like a real house down stairs. 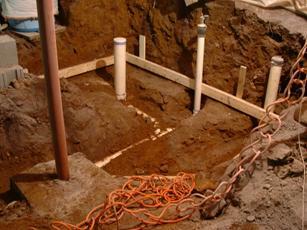 The next thing is to install the rough plumbing and move the old pipes. 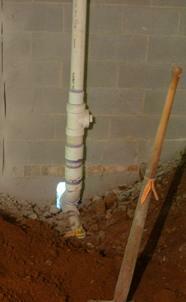 Villazon Plumbing, Waynesville , NC did a great job here. 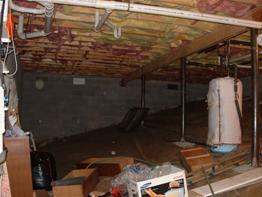 All the pipes hanging below the floor joists must be moved. 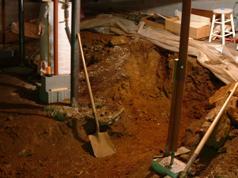 They are routed below the new floor and connected to the existing pipe exiting the house. 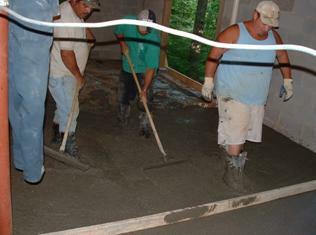 After some time the floor is checked for level and gravel is brought in to ensure that no water will be in contact with the floor. What a difference from the old space to the new. It looks even better when the concrete is pumped in. 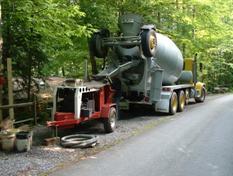 Gerry Green Concrete and his crew, led by Ed, did a great job. Big Ed knows how to float! Next the outside stairway foundation and framing goes in. 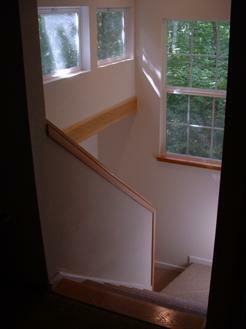 The upstairs sliding window is removed and replaced with an atrium door and a stairwell entrance. 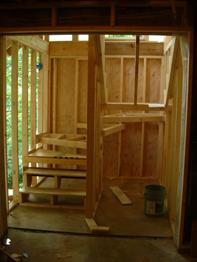 The new stair well will have plenty of light with a window on the left and 2 clerestory windows above the new roof. 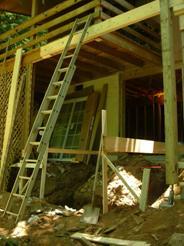 The existing roof over the deck becomes the roof over the stairwell. 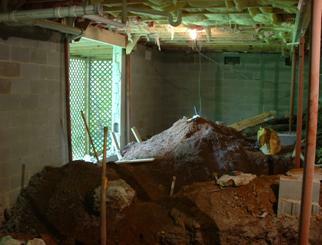 Note , the main corner deck post had to be removed to make way for the new foundation. No the hydraulic jack is not the only temporary support! There is another column that you can't see. 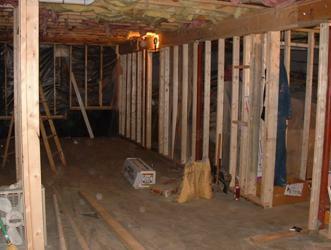 Inside and stair framing now goes in along with the rough electric. The owner saved considerably by doing the electric work. In Haywood County , NC , owners can do their own electric work, even if the general contractor is involved, as long as the inspector sees the owner during the inspections. 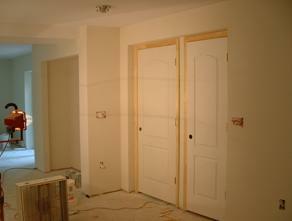 Drywall goes in and things really shape up. 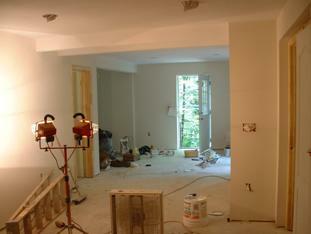 L&L Drywall of Cherokee, NC did an outstanding job. 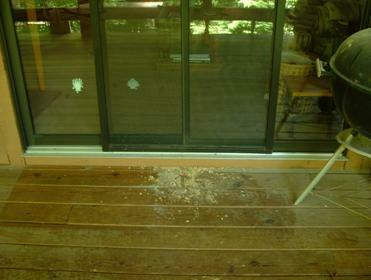 The outside gets painted to match the existing color and the new deck arrives. The owner helped with the deck and she's pretty proud of it! Rosy the riveter! 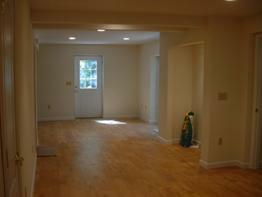 What's left is painting, flooring, finish stairs, bathroom and heating. Actually, that's still a lot to get done but it's all inside work and not effected by the 2003 monsoon season. Here are the rest of the pictures. 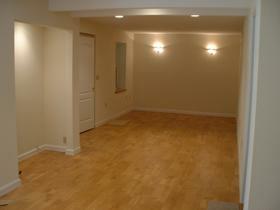 Laminate and tile floors, arched panel doors and Berber carpet for the stairs. Some before and after shots just so you don't forget where it started.!!!!!! All projects are different but not unlike the one you see here. Lets look at the numbers. Property value is based on a simple $/SF calculation that the county uses to determine assessment. The value of the land remains the same. The actual numbers are not used but the ratios are real. This is one way to really increase the value of your property. Let Profiles in Wood, Inc show you how to do it. Contact us now! 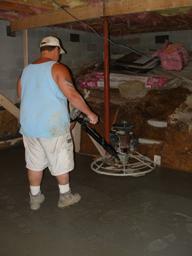 Special thanks to Lowes , inc and Ralph, Beason, Jim and Tom. They made sure that the special orders did not become "special"!